ALAYNE: As a graduate student in Business school a lot of what I write can be dry, and data driven. (here’s what she means, “We considered the impact of non-recurring incomes statement items and calculated persistent earnings as well as five year incomes statement line item averages for each company”) That’s why I work the hardest on having a conversational tone. Whenever I’m editing my writing, I read it aloud and imagine that I am talking to another person. SAMANTHA: The way I keep my writing interesting is to connect all my classes together. For example, if I am taking a history class or English class, I will use the materials as anecdotal evidence in another paper. For example: If you’re asked to analyze the idea of race in the United States you can incorporate your knowledge of the civil rights movement and race driven court cases that you learned in U.S. history or political science. Also, another method is to apply the essay topic to my personal life. This way, I truly feel like I am not “wasting” my time reflecting on the essay topic. 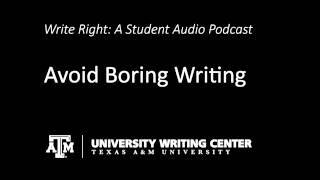 So instead of complaining to your professor that “Writing papers are completely boring and pointless” just say that “the practice of crafting manuscripts is exhaustively platitudinous and trivial.” Also, showing critical thinking in your writing lets the reader know you thoroughly understand the topic and are able to draw your own conclusions. He is skipping class each day to play DDR. He skips class each day to play DDR. KRISTI: Hi my name is Kristi Thomas and I think that adding humor, if it is appropriate, really helps your paper stand out from the rest of the stack of droning papers that your professor has to grade. I think that a lot of students have a misconception that school papers have to sound wordy and formal, but I have seen many examples of lighthearted papers that get the same point across::even more effectively because they are easier to read. Here are some famous examples by Mark Twain that you probably shouldn’t include in your paper. When talking to your prof. about Nathanial Hawthorne don’t say “A classic is something that everybody wants to have read and nobody want to read.” And when you professor is handing out the assignment don’t say, “Work is a necessary evil to be avoided.” Also, research papers don’t need to be a regurgitation of facts. Working the facts into your own words makes it more interesting to read because the audience doesn’t feel like they have been assigned a few pages in a textbook to read. LAURA: I choose topics that I think are interesting, important and potentially useful. Then I’m more involved and interested in what I’m writing. For example: Navaho Burial Rituals; The Art of Curling; Overuse of Ritalin on America’s Children. FLORENCE: I used to do to make sure my stories weren’t boring was to read them aloud to my four year old niece. Although for the most part, she had no clue what I was saying, she was actually a good judge of the rhythm and fluidity of the paper. If she fell asleep (rockabye-baby) I knew that it needed work. If she stayed awake, (“dedal de deet”: upbeat noise) I was probably heading in the right direction. Crazy, but it’s true! ABIEE: My technique is to get many individuals to read my writing. While they read, I observe their body language in order to find out whether my paper is interesting. If they ask detailed questions pertaining to my work (hmm, interesting), I know they are interested in my ideas and that my paper is not completely boring (yawn: huh, what I thought you were finished). RON: When I write a sentence I choose each word for the purpose of conveying my thoughts and feelings as precisely as possible. When writing I always have a dictionary at hand to check meaning and possible and synonyms. I try to learn a new word every time I write. One of my high school English teacher’s suggested this to me (Don’t forget Ronny, ruler smacking) and since then I’ve always tried to do it.